“Dance and Embodied Knowledge in the Indian Context” is a unique theory-practice undergraduate course at Emory University cross-listed between the Departments of Dance and Religion. The course, now having been taught four times, includes a lecture component on Indian aesthetics and performance theory and a practical component involving training students to perform Kuchipudi dance. Envisioned by Emory religion professor Joyce Burkhalter Flueckiger, the development of the class has been a team effort with Kuchipudi professional dancer, choreographer, and Emory artist affiliate Sasikala Penumarthi; Emory physics professor P.V. Rao; and graduate students from the Graduate Divisions of Religion and Anthropology, Katherine Zubko, Arthi Devarajan, Harshita Mruthinti Kamath, and Claire Hefner. The reflections below are written by Flueckiger and Kamath, who were involved in distinct components of the course; they have written individual sections, which are identified below. When I first started teaching Hinduism classes at Emory University, Hindu students sometimes commented that their parents “didn’t know anything” about Hinduism. I often asked these students whether their parents performed the ritual of puja (offerings) to Hindu deities; the answer was “yes.” I responded that their parents, then, knew something—through their bodies—even if they could not always talk about what they knew discursively—i.e., explain why they were doing the things they were doing. These interactions led me to think about ways to learn and teach about how knowledge is created and expressed through the body. More specifically, I looked for a body practice that we could incorporate into a class in order to address the issue of “how bodies know.” My assumption was that students would learn how their own bodies carry and learn new forms of knowledge if they actively engaged in a specific body practice. Sasikala Penumarthi was already teaching the classical Indian dance form of Kuchipudi in the Dance Department, in a class on world dance forms, and she readily agreed to participate in the class both as a conversation partner in our discussions and teacher of the dance form. After several iterations of the class, we added one week of yoga practice (taught by Emory dance professor and yoga instructor Anna Leo) and discussion, in which we address differences in the goals and audiences of dance and yoga and what was created for the students in the practice of these forms of movement. 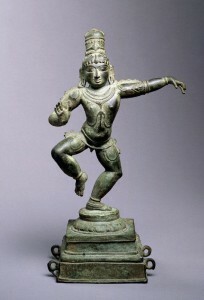 Dancing Krishna. India, Tamil, Nadu, Late 13-13th centuries. Michael C. Carlos Museum, Emory University. We structure the class to meet three times a week—with one day dedicated to dance instruction and practice and two days to lectures and discussion. For the latter, we begin the course by reading Hindu mythologies of the dancing deities Shiva and Krishna, asking what happens (or is created) when a god dances. We read these stories as a narrativized performance theory. In this section of the course, we also look at paintings, lithographs, and sculptures of Krishna and Shiva dancing and ask what each mode of visualization creates differently from both the narrative and choreographed dances of the same narratives. In the practice part of the class, we dance Krishna and throughout the semester reflect on what we learn and experience about Krishna through our own (unique) dancing bodies in this Emory classroom context. We also discuss the ways bodies are used and reflected in other Hindu devotional (bhakti) poetic and dance traditions; the ways the dancing body became a site of contestation and identity in colonial and postcolonial India; and the ways in which Indian dance in diasporic contexts creates identities in different ways than it does in India. One reading that has been particularly generative in helping the students think through the ways in which their own bodies carry knowledge has been Greek anthropologist Nadia Seremetakis’s essay “The Memory of the Senses”.1 Seremetakis identifies and analyzes three embodied practices in Greek culture that she calls “resting moments,” which create and perform memory: drinking coffee, picking wild greens, and embroidery. Students have written creative essays identifying similar modes of embodiment that they had not previously thought of as “knowledge” and analyze through performance studies’ frameworks what these practices create. One student who grew up in India wrote about what he had learned through walking barefoot through muddy rice fields, on hot pavement, and through cool home interiors in India. Another student, unused to going barefoot in public settings, reflected on what she had learned through the simple act of taking off shoes and socks in a university setting and through the feel of her bare feet on the wooden floor of a dance studio. Other students have written about the knowledge body practices and material culture have created at communal events such as Thanksgiving dinners, Catholic confirmation rituals, and bat mitzvahs, as well as through personal moments, such as childhood foiled-wrapped chocolate eggs, a train journey, and a high school art project that unconsciously reproduced a childhood chair. After one student described and analyzed what was created through the body practice of her grandmother having fed her with her hands as a toddler, we invited the class to my home to eat Indian food with our hands, seated on the floor—which led to an interesting discussion right there on the floor about what assumptions are made and what is created through where and how one sits to eat and whether one eats with one’s hands, is fed by the hands of others, or uses utensils. The class introduces three primary analytic frameworks within which to consider dance and embodied knowledge: western analytic performance theories (Catherine Bell, Richard Bauman, Richard Schechner, Phillip Zarrilli), Indian classical aesthetic (rasa) theory (Natyasastra), and theories of emotion (Paul Eckman, Keith Oatley). We read sections of the classical Indian dance manual, the Natyasastra, which prescribes certain body gestures, facial expressions, etc. to create particular rasas (aesthetic emotions). This performance theory assumes an idealized audience (rasikas) educated in the performance traditions they are witnessing; and it is prescriptive (what performers need to do in order to create particular rasas), in contrast to western performance theories that analyze and describe, rather than prescribe. 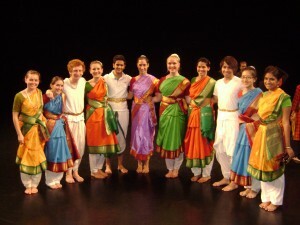 During the semester, students attend at least one performance of Indian dance in Atlanta to analyze the ways in which rasa may be performed and embodied by professional dancers, as well as what is created for different audience members who may be familiar or unfamiliar with the dance genre they are witnessing. When the audience includes non-specialists, western performance theoretical frameworks help students to analyze what else may be created through the performance, if not rasa. As beginning dancers, in their own practice and final performance, it is rare that students will experience or create rasa. Rather, they learn other things about their bodies. It becomes clear to the class, for example, that the bodies of students who are dancers are trained to learn and remember movement sequences much more easily than those of us who are not dancers. These same dance students, however, are embodying new Kuchipudi movements that are very different from ballet or modern dance, which raises questions for them about how their dancing bodies learn and with what assumptions they come to dance. We end the semester by performing a short Kuchipudi dance piece for friends, professors, and other dance classes, for which we have practiced all semester. We dress (for the first time) in practice saris, wear dance ankle bells, and wear dance makeup. Many “non-dancers” (myself included) are surprised at the ways in which this costuming itself helps to reinforce and elicit memory of the choreography, the differences having a live audience makes in what dance creates, and what our bodies learn through performance itself (rather than just practice). In the most recent iteration of the class in 2011, my co-instructor Harshita Kamath suggested that, instead of writing a final take-home exam, we give the students an option to choreograph and perform a short piece using Kuchipudi gestures and footwork and write a short essay discussing their choices and challenges. Several dance majors chose this option: two dancers performed a piece based on William Yeats’s play At the Hawk’s Well, and another student choreographed (to her own reading) Kurt Vonnegut’s short story “Harrison Bergeron,” for which a video is included (figure 1). 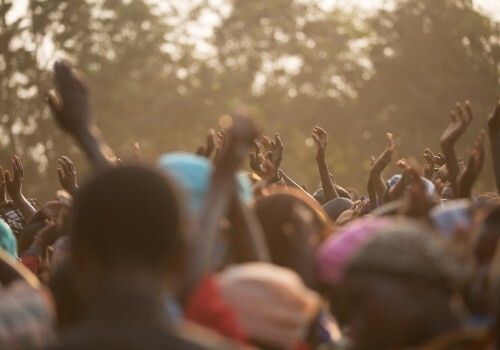 In his essay in the “Roundtable on Ethnography on Religion” (included in this issue of Practical Matters), Robert Orsi encourages scholars of religion to “do religious studies with our whole bodies.” This theory-practice class is one step in that direction. By dancing with our whole bodies, we have learned the kinds of questions and emotions body practices can raise and the spectrum of identities and relationships they can create. We study and apply the theories that have developed both in Indian and non-Indian contexts that have attempted to account for these. As (mostly) novice dancers, we cannot fully know through our own bodies what professional dancers and “educated” audiences (rasikas) of Indian dance experience and know, but we learn that body practices “do” something and “count” as knowledge. In the fall of 2011, I was given the opportunity to co-teach “Dance and Embodied Knowledge” as a co-instructor for the lecture component, alongside religion professor Joyce Flueckiger, and as the primary dance instructor. As a longtime student of Kuchipudi artist Sasikala Penumarthi, I felt anxious about stepping into her shoes to teach the dance portion of this course. Several concerns came to mind: how can I teach Kuchipudi dance to a group of undergraduates, many of whom have no prior dance exposure? How can I teach them what amounts to several years’ worth of training in the span of a semester? How will the students perform a dance item to an audience at the end of the semester? In what follows, I outline my pedagogical approaches in teaching the dance portion of the course, drawing on my experiences of having both taken and taught the course at Emory University. My first exposure to “Dance and Embodied Knowledge” was during my undergraduate coursework at Emory College, when I had the opportunity to take the course with Flueckiger and Penumarthi as the primary instructors and Arthi Devarajan, a graduate student in Emory’s Graduate Division of Religion, as the teaching assistant. Aside from the select number of students with previous exposure to Indian classical dance forms such as myself, the majority of the class had no prior training in Kuchipudi and struggled to learn the basic steps and gestures in the Friday dance sessions. Through our weekly fifty-minute sessions, we learned the proper posture (saustavam), hand gestures (mudras), basic movements (adavus), and extended pure dance sequences (jatis) that comprise the five-minute piece “Narayaniyam,” which is dedicated to the Hindu deity Krishna. Our enthusiasm and anxiety in learning this item was compounded by the fact that at the end of the semester, we were to present our item in front of an audience of peers and professors. Kuchipudi Dance Festival morning rehearsals, village of Kuchipudi, Andhra Pradesh, March 2006. While we expressed concern, Penumarthi remained unwavering in her command over the class. As a seasoned dance guru of two decades, Penumarthi taught our class with skill and efficiency. We covered a great amount of ground in a short period of time, and those of us who had no prior exposure to Kuchipudi dance were able to perform alongside others with several years of training. When I was given the chance to teach “Dance and Embodied Knowledge” during my doctoral coursework in Emory’s Graduate Division of Religion, I opted to focus on certain elements in the dance classroom, which I outline here. First, I chose to emphasize the spatial, particularly the position of students in the dance studio. Having been exposed to Indian classical training both in the United States and India, I was familiar with one basic element common to both contexts: rows of dancing bodies. Whether it is in the dance spaces of Chennai or Atlanta, dancers line up in rows according to height order, such as those depicted here. In an attempt to recreate this spatial atmosphere, I began my class by arranging the students in three rows according to height, which gave everyone an opportunity to see the front, particularly the mirror, while also maintaining a sense of orderliness found across Kuchipudi classrooms. This orderliness not only framed the spatial arrangement of the classroom, but also created discipline in the body, which is a crucial component for Indian classical dance performance. The students in my class thus became part of the rows of dancing bodies on the global Kuchipudi stage. The second element I emphasized was posture. While most Kuchipudi students learn to lift the chest and curve the back to maintain the correct posture, known as saustavam, many dancers struggle to maintain this posture for extended periods of time. In order to highlight the importance of posture, I required the students to spend sixty seconds only focusing on saustavam in the beginning of each class. The students were then required to do the same for aramandi, the half-seated position that is essential to south Indian classical dance. This deliberate focus on saustavam and aramandi in the beginning of each class not only enabled embodied movement, but also created contemplation about what this posture and position should feel like in the body. By contemplating position, the muscles of the body were trained to learn and remember posture and position. Embodiment, therefore, was an act that required contemplation. Students of the “Dance and Embodied Knowledge” course after their final performance on November 29, 2011. The final element I emphasized was repetition. Remembering the difficulties that some of the students faced learning Kuchipudi during my undergraduate class, and knowing that I could not replicate Penumarthi’s efficient training, I opted to simplify the material and only focus on the item “Narayaniyam.” While learning basic steps and gestures are necessary for grounding a long-term student in Kuchipudi dance, I felt that the students of “Dance and Embodied Knowledge” would be better served in learning fewer movements and repeating these often. For the first six weeks of the course, I taught the students a few movements from the jati, or the complex technical sequence, found in the beginning of the piece “Narayaniyam.” Once we learned a movement, we repeated it over and over and over. 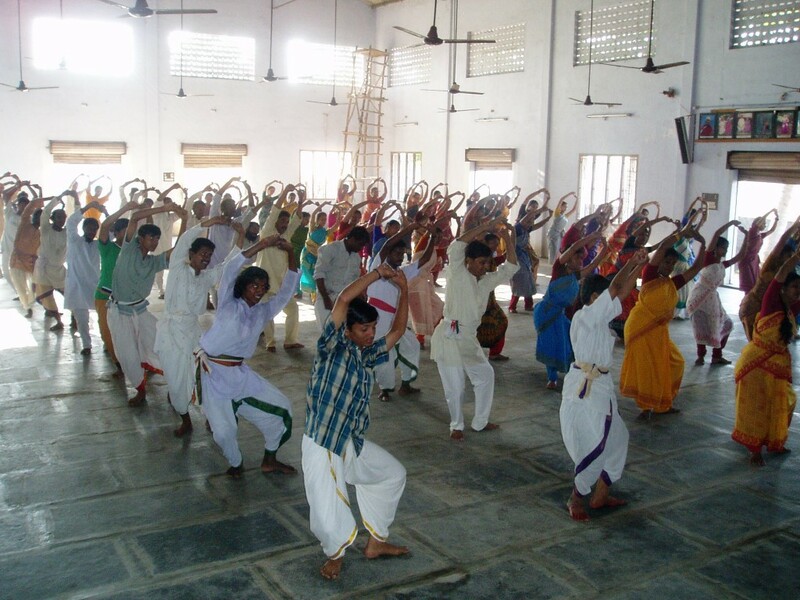 While this method of repetition was likely tedious for those students with prior training in western or Indian classical dance, it appeared to help those with limited exposure to the performing arts; those students who grasped a movement quickly were able to sharpen their technique through repetition, while those who needed additional time were given the chance to practice more. By repeating, students were not only able to become familiar with a movement, but also allow their bodies to remember that movement. Repetition thus enabled embodiment. Figure 2 – Click the image to view students in their final performance. The south Indian classical dance forms of Kuchipudi and Bharatanatyam both have unique performances known as an arangetram or rangapravesam that marks the formal entering onto the stage. In contemporary times, thearangetram has taken on special significance for young women both in India and in the American diaspora, and has even been likened to a rite of passage such as the bat mitzvah in the Jewish tradition.2 Dance scholar Susan Schwartz describes the arangetram as follows: “A young woman goes up, stands before her community and her family, and participates in a religiously charged activity that requires intensive preparation and education in traditional forms and contexts.”3 While the arangetram, which can last for several hours and usually includes a live orchestra and several costume changes, is certainly an elaborate affair, the final performance of the “Dance and Embodied Knowledge” course was similar in many ways. Just as the Indian classical dancer undergoes “intensive preparation and education in traditional forms and contexts,” so, too, do students of this course learn about embodiment and dance in Indian traditions through both intensive reading and embodied practice. As these students take the stage for the first time, they engage in their own creative interpretation of the arangetram, which is evident in the photograph and video (figure 2). Through the “practice” of full performance for an audience (wearing dance costumes for the first time), they have a unique opportunity to directly engage with the theoretical frameworks of emotion and body, of rasa and performance studies. Through this course, students learn to analyze embodied knowledge in the classroom, to create embodied knowledge in the studio, and to perform embodied knowledge on stage. C. Nadia Seremetakis, “The Memory of the Senses, part I: Marks of the Transitory,” in The Senses Still: Perception and Memory as Material Culture in Modernity (Boulder, CO: Westview Press, 1994). Susan Schwartz, “She Stands Before Us to Bear Witness: The Arangetram and the Bat Mitzvah in the Diaspora,” (paper presented at the annual meeting of the American Academy of Religion, Denver, CO, November 17-20, 2001). Susan Schwartz, Rasa: Performing the Divine in India (New York: Columbia University Press, 2004), 88. Joyce Burkhalter Flueckiger is Professor of Religion at Emory University. Harshita Mruthinti Kamath is Assistant Professor of Religion at Middlebury College.